How Could Iowa Have Saved $500 Million? State spending is a major area concern of many in Iowa, especially as our government continues to demand more taxpayer dollars. As we travel the state and listen to taxpayers, the question we are most frequently asked is, “How can we make the state stop spending so much money?” One answer to that question is to pass a proposed Constitutional Amendment that would do just that. Iowa code currently limits the legislature to spending a maximum of 99 percent of projected revenue in a fiscal year. But this is a weak spending limitation law and one that can always be cast aside by a future legislature. A stronger spending limitation that is written into the Iowa Constitution, where it could only be removed by a vote of the people, would be much more effective. State Senator Charles Schneider wrote that the LSA analysis “shows that if the spending limit had been in place since fiscal year 2012, state government could have spent $488.2 million less than it has.” The impact of this would have been substantial, especially with Iowa’s current tight budget. “Going into fiscal year 2017, we could have had a carryover surplus of at least $442.8 million. Had that been the case, we would not have had to deappropriate funds for fiscal year 2017, and we would not have to dip into the cash reserve fund to fill the remaining budget gap for this fiscal year,” stated Senator Schneider. Currently 15 states have a spending limitation requirement written into their constitutions. Although spending limitations can vary upon their strength and design, they provide both a protection for taxpayers and sound fiscal policy by keeping spending in check. Constitutional scholar Rob Natelson wrote that “history teaches that politicians seldom control spending unless the constitution that regulates their conduct requires them to do so and the courts choose to enforce the constitution.” This problem is clearly seen at federal level with the uncontrollable spending that has resulted in a $20 trillion national debt. Taxpayers deserve stronger protections against the unquenchable appetite for government spending. Families and businesses across Iowa often have to make difficult budget decisions on a regular basis. Seldom does government, at any level, say that they can function with less; it must always be more and more funding. 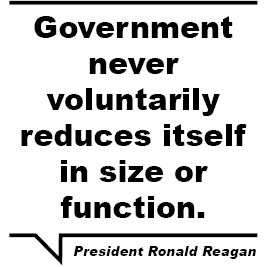 President Ronald Reagan was correct when he stated that government never voluntarily reduces itself in size or function. If policymakers are able to keep spending restrained, this will also provide an opportunity for Iowa to begin lowering tax rates. Lower spending and lower tax rates is a formula that will allow Iowa’s economy to grow and at the same time being respectful toward taxpayers’ dollars. 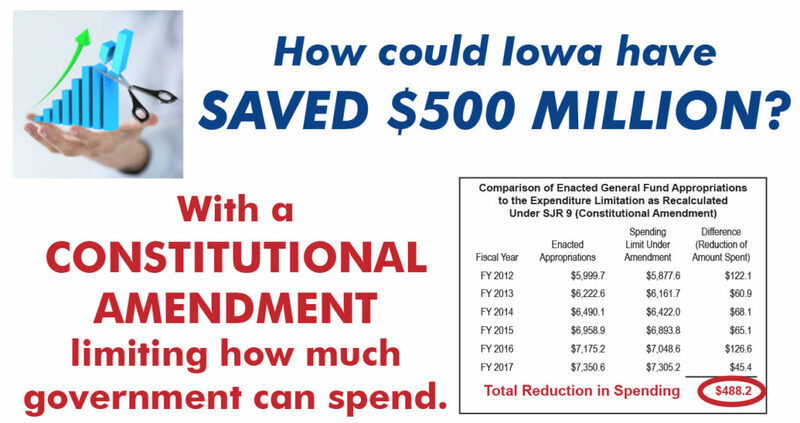 Iowa taxpayers deserve additional protections and the best way to do this is add a strong spending limitation to the Iowa Constitution.